← God’s timing in perspective! It is stealthy and cunning and treacherous. It works in a subtle way and can be deadly. It is a thief and a murderer – it robs one of the will to live of joy and hope and in extreme cases can lead to death. The only time that I have suffered real depression was when I was diagnosed with postpartum depression after the birth of one of our children. It lasted for six dark, dreary months before it lifted. Recently, however, a darkness has been closing in on me and my joy in the Lord and in life has been slowly fading. I have been repeating the following words “life is too difficult, I don’t want to do this, I can’t do this anymore”. I think it started when I heard the news that a fifteen year old girl in our community had killed herself. I have found myself, almost on a daily basis, crying for the mother, desperately longing that I could take her pain away. My own father is dying and that has brought a lot of emotion to the surface for myself and my siblings. I am struggling with the pain and hurts of my own children – when they feel they are failures, when they are hurt by friends, when they are lonely – I take that burden on myself and carry it and gradually the burdens have been getting heavier and heavier. My husband told me recently that my life was just like a truck. I was constantly stopping to pick up burdens along the road, a majority of those burdens don’t even belong to me but I have picked them up and put them into my truck anyway and driven off with them! My truck is soon going to be too heavy to drive. On top of that I am only looking at the side of the road to see what burdens I can pick up next. I am ignoring the amazing beautiful view of life that I have through the windscreen. So today I took a hammer and some nails, climbed into my truck and drove to the cross. 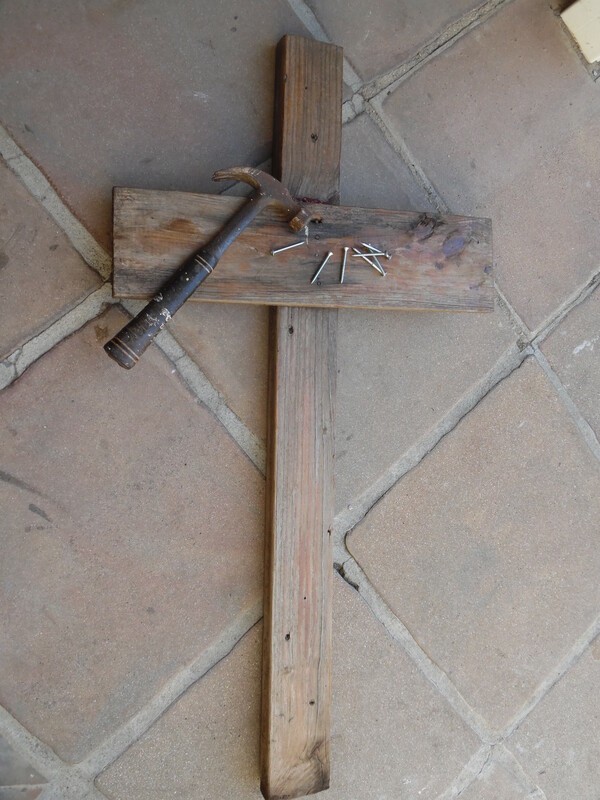 I parked at the foot of the cross, climbed into the back of the truck,took the hammer and the nails and started hammering my burdens one by one to the cross. The burden of sorrow, the burden of anger, the burden of disappointment, the burden of addictions, the burden of lack of faith, the burden of self-worthlessness, the burden of doubt, the burden of self-pity, the burden of grief, the burden of lack of appreciation ….. each and every burden was nailed to that cross. It took me most of the day to unpack and nail the burdens. I am going to start shining again! This entry was posted in Death, Depression, Family, Jesus and tagged faith, forgiveness, grace, growing up, self worthlessness, thankfulness. Bookmark the permalink. How great is the love of our Lord God Noelene. Depression has also knocked on my door at various times but just like you, I held on to the hope we have in Jesus. He truly is the lifter of our heads and I love that He is faithful to us, His children! It was such a cleansing act being able to figuratively just hand God all my ‘burdens’ and to acknowledge that the Joy of the Lord is my strength. Thank you for commenting my precious friend. Thanks for this start to my day Noel. It is all too easy so often to feel that we are walking a particular road alone but to know others go through the same things is encouraging. In these times God can sometimes be too intangible and the sharing of generous people like you provides such encouragement. I trust God’s healing hand will reach out to you today especially and that your pain will be less – even for a day. The response to this blog has been overwhelming Susan via messages and emails. The majority have said “I too, have felt/am feeling exactly the same”. God uses all things in our lives and through this time of depression His love has been made manifest in such a beautiful way in my life. I have grown and moved into a deeper understanding of who He is. It is great! Thank you for reading and commenting. As always, it means so much to me .